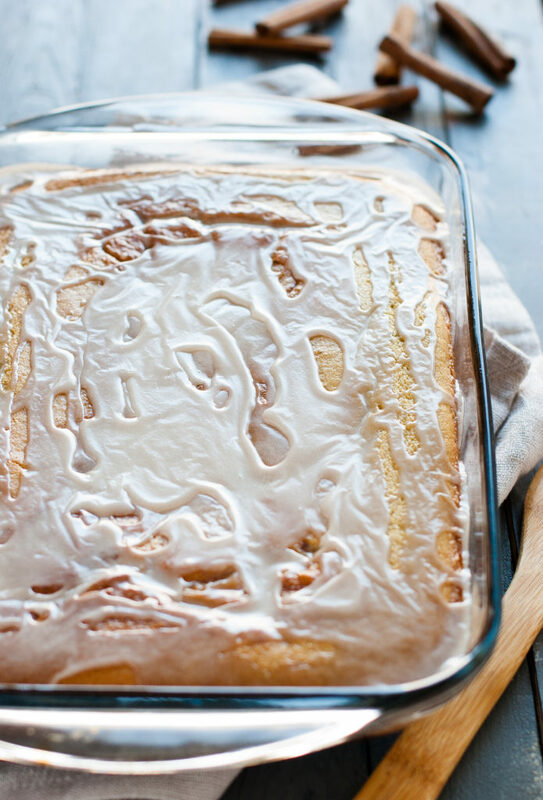 This is the best gluten free cinnamon cake recipe that’s Like a Cinnamon Roll. It may just be the best cake I’ve ever eaten. Seriously, I had a hard time shooting a picture of it because I wanted to eat the whole thing right then and there. This is THE most tender cake I have ever had. I was asked to make the treat for a family party we were putting together and I gladly accepted. 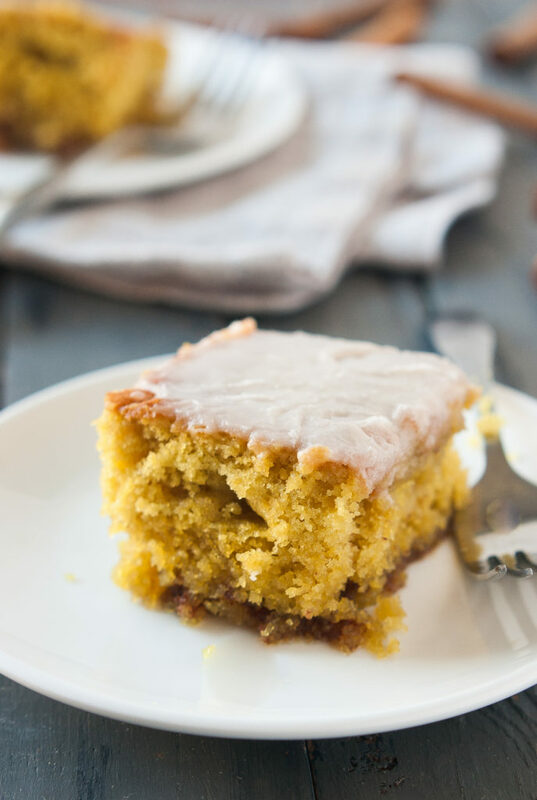 I have been wanting to experiment and create the best gluten-free cinnamon cake recipe. I was very happy with the results and so was everyone who ate it. It was the hit of the party and no one cared that it was gluten-free or made from quinoa flour. I can’t taste the quinoa flour in this recipe because the cinnamon masks it so well. You could make it for breakfast, but I’m not the type of person to think regular cinnamon rolls are a suitable breakfast, so it’s hard for me to want to recommend cake for breakfast. But, it doesn’t seem any less healthy to me than regular cinnamon rolls. I thought that instead of rolls but making it in the form of a cake was a brilliant idea! This way a large piece can be cut or a small one depending on diet/preference. 🙂 If you want it to “look” more like a cinnamon roll you can take a glass or anything round and push it down into the cake to cut it after baking it. Doing it this way cuts out all the rolling and rising too! This is so much easier and faster than traditional cinnamon rolls. I’m the kind of mom that’s never going to make regular cinnamon rolls. That’s just way too much work for me, so this is a compromise I’m willing to accept. I hope you enjoy the best gluten-free cinnamon cake recipe ever. Do you like cakes when they are hot or cold more? Let us know in the comments and how you enjoyed the recipe. This might just be one of the best cakes I have ever had. Seriously, I had a hard time shooting it because I wanted to eat the whole thing right then and there. I added tapioca starch to the quinoa flour and the texture was so tender and perfect. I reduced the sugar by 1/3 in the cake along with changing all ingredient amounts and the prep method(using melted butter instead of solid), and added milk. This is THE most tender cake I have ever had. In a large mixing bowl, whisk together the quinoa flour, tapioca starch, sugar, baking soda, baking powder, and salt until combined. Pour the melted butter, eggs, and sour cream into the bowl of dry ingredients and whisk together until combined. Add the milk and whisk until smooth. Pour the batter into the greased baking pan. In the bowl of a stand mixer, beat the softened butter with the browned sugar, quinoa flour, and cinnamon until smooth. Scoop into a piping bag and cut the tip off(about ¼”). Pipe the cinnamon sugar/butter over the cake batter in swirls. Bake the cake in the preheated oven for 35-40 minutes, or until the middle is puffed and firm to the touch. In a mixing bowl, whisk the powdered sugar with the vanilla and milk until smooth, adding more or less milk for the preferred consistency. Let cool for 5 minutes and drizzle the glaze across the top. *do note that the quinoa flour will give the cake a very yellow color. 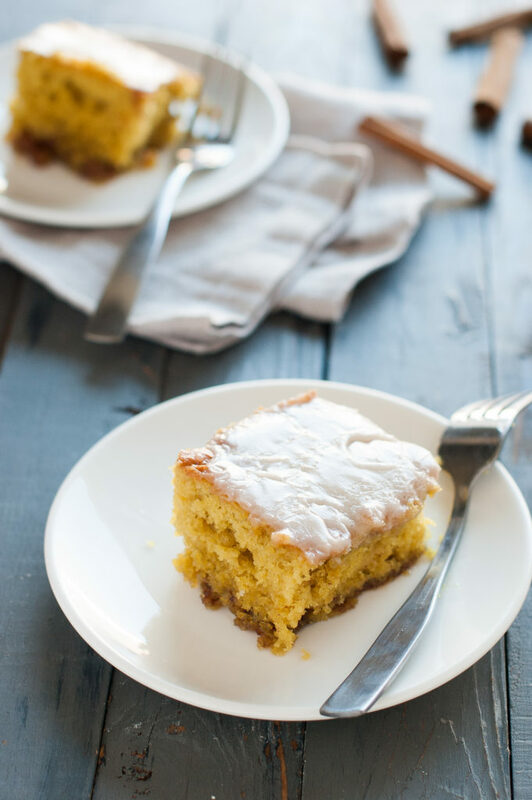 I hope you love this gluten free cinnamon cake as much as I do. These look delicious!! And thank you for making the recipe gluten free! You’re welcome. I LOVE cooking with quinoa flour. Yummy looking recipe. I like cinnamon rolls. was just thinking about making home made cinnamon rolls yesterday, yummm! I am am so going to make this! These sound and look great! Trying this as soon as humanly possible! Carrie Bernard – Please let me know if you like it! I made this for New Year’s morning and we weren’t crazy about the quinoa taste in this kind of sweet recipe. I’m making it for tomorrow morning, but this time I’m going to try it with a coconut blend four. Will you please let us know how you like it with the alterations? Thanks for sharing! This cake looks delicious, I am anxious to try it for a Saturday morning breakfast at our house! If you try it, please let me know how you like it. I am so happy to see the post. First of all this inspires me in terms of making gluten free recipes. I have a child who is on the spectrum and who has serious health issues. I have been intending to try a gluten- free diet for him for many reasons. Also, I am so interested in the fact that you have biological and adopted children. I have 5 of my own and I have been thinking about adoption (sounds crazy). I would love to chat more!! I am so drooling right now! I am looking forward to trying this one. This cake is incredible. I made it for Christmas and am going to make it again next week! I’m gluten intolerant and found out this fall I have to go off rice and potato as well. This was my first time making anything with quinoa flour, not to mention my first time attempting to bake a dessert since going off rice and potato, and it was PERFECTION. Thank you thank you thank you!! You are so welcome. Glad we could be of help! This cake sounds amazing! Your recipe has been pinned Rebecca. Boy we miss cinnamon rolls at our house! I can’t wait to make these for my boys this weekend. Yum. Oh I am glad it worked well for both you and your husband! Thanks for the comment! Can you make this dairy free ? We follow a low fodmap diet, are gluten, dairy & soy free. By chance can you replace the butter & sour cream with something else ? I’m not sure. I haven’t tested it, but the butter could probably be replaced with an oil or your choice. For the sour cream, you could try a Paleo sour cream, either made from coconut cream or cashew cream. You can search on Google to find a recipe for those that sound good to you. Sorry I’m not more help . . .